A draw shot is largely considered to be one of those amazing golf shots that many golfers can only dream of hitting. It is considered so, usually because most average golfers slice the ball (a left to right shot). But in order to draw the ball a golfer must understand what creates a draw in the first place, and also how to hit it. NOTE: I do not personally recommend that people hit a draw. Rather, I recommend people hit the ball straight or fade the ball from left to right. The reason I say this is because of the difficulty in achieving a draw shot. Also, a fade is easier to maintain on the greens than a draw (particularly with long irons). This is because the clubface is closed when hitting a draw, but it is open when you hit a fade. Therefore, the trajectory of the draw shot is lower and it has less backspin than a fade, so a draw won’t stop as quickly on the greens. Next, the majority of holes on the golf course are designed so that the ball should curve from left to right. Lastly, a fade allows more room for error than a draw, meaning that even when you’re not playing your best golf you’ll usually be able to get the ball around the course with a fade shot. Hitting a perfect little draw around the course all day needs you to always be on your “A” game. When Jack Nicklaus refers to the fade as his “bread and butter shot ” there has to be a reason for it. There are two possible draw shots you can hit. I call them the “real draw” and the “fake draw.” Whether or not you want to hit a draw as your regular shot, there will be occasions when you need to use a draw shot (e.g, curving the ball around a tree or a dog leg left). If you normally hit the ball straight, or try to fade the ball, and are presented with a situation like this then use the “fake draw” (described below) only. Never even attempt the “real draw”. Conversely, if you insist on hitting a draw as your regular shot, then I would personally suggest you master the “fake draw” first, then graduate to the “real draw” later. The reason for this is that if you can’t acheive the “fake draw” (which is an easier shot) then there is no way you’ll be able to master the real draw. Bear this in mind as you read more about the two different draw shots. The real draw is a shot that curves from right to left approx. 5 yards with irons (8 iron and up) and approx. 10 yards with woods. 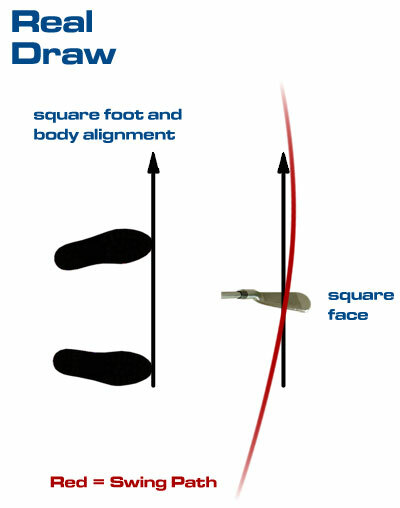 A real draw is performed from a square stance and body alignment (not closed). Because the swing path with this type of shot is a little more from the inside than a straight shot, the ball will start out to the right of the target line. As the club makes contact with the ball, the clubface is square in relation to the line of the target. Or in other words, the clubface is closed relative to the path the club is swinging on. It is this closed clubface position (relative to the swing path) that causes the ball to spin back to the target. So, a real draw has you with a square stance and body alignment. The ball starts slightly right of the target and spins back to the target. A pulled or pull hooked shot is when the ball ends up left of your target line and stance and body alignment. The first thing we have to look at is the stance and body alignment. 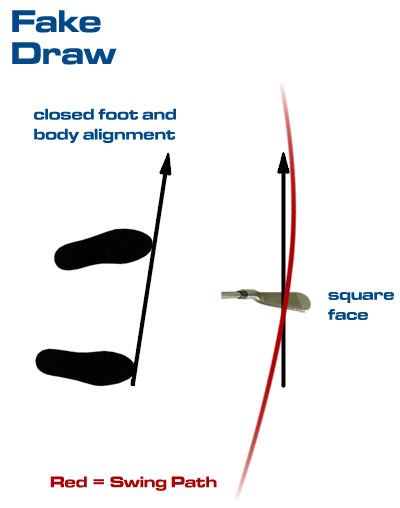 With a real draw, the golfer has a square stance and their body is also aligned squarely to the target. This means they are parallel to the target line (not closed). From this square stance and body alignment, the path of the club swings inside out which starts the ball out to the right of the target. This inside out path is caused because of the golfer’s body tilts excessively to the right through impact. This excessive tilt can be caused from sliding laterally to start the downswing, bumping the hips to the left to start the downswing or just over tilting your body to the right. The more the tilt the golfer has in the downswing, the more right they will hit the ball. Don’t believe me? Go to the range and slide laterally, bump you hips left or overtilt coming down. If you do, you will clearly see that the ball will start right which is the proper direction of a draw shot. This is only half of the equation though. You still need the correct spin on the ball to allow it to draw back to the target line. Once the golfer gets the ball starting to the right, he/she has to put the spin on the ball to allow it to come back to the target line. This spin on the ball can be achieved with a grip that is too strong, or from the golfer rolling their wrists over with a neutral grip. Remember … the swing path is out to the right so all the golfer has to do is square the face relative to their body or target line. In doing so, the face will be closed to the inside out swing path the club is making. If the face is closed to the path, it will allow the ball to spin back to the target line thus producing the magical draw. So, who hits a real draw? Good players. This is because good players use their body to hit the ball as opposed to just whacking at it solely with their arms. If you just use your arms your club will come over the top and produce an outside in swing path and by hitting the ball solely with your arms your wrists will probably be too tight so the face will not square. This means it will be open upon contact which will not allow the ball to spin from right to left. These 2 things are the exact opposite to what is needed to hit a “real draw” so is there any wonder why so few people can actually hit this type of shot? A good player who hits a draw is usually sliding a little in the downswing. As I said, this slide creates the path. Often times than not, this better player also has grip that is a little too strong as well. This grip causes the ball to draw back. 1. They flip their writs through impact causing a duck hook. 2. Their wrists tighten through impact which causes a push to the right. 3. They slide or tilt their body too much in the downswing which causes a duck hook or a push depending on how tight their wrists are. 4. Their grip is too strong. For a fake draw you need to align your entire body (not just your stance) out to the right of your target. I say “not just your stance” because so many people think that if they just drop their right foot back a little, they will draw the ball. A golfer who thinks this way has no idea what they are trying to and it will never work. So, with this shot you are aiming your whole body (shoulders, hips, knees and feet) out to the right of the target. A good way to make sure you are doing it properly is to lay a club on the ground that is slightly right of the target or as you do your set up you can swivel your head to look at your target. As you do this, you look out of the corner of your left eye and see your left shoulder in line or slightly right of the target (not left of the target). When you feel your whole body is aimed slightly out to the right of your target, DON’T move. So many times I see people try this shot and they get their body aimed slightly to the right then they try to get comfortable, In doing so, their shoulders end up twisting to the left and all of a sudden their whole body is not aligned right of the target although they may think they are. This type of alignment will not allow the person to swing out to the right. The club will swing down the line of the shoulders thus creating a pull or pull hook. With the fake draw, I am going to talk about the clubface first. To get the ball to draw back to the target line, all you’re doing is setting up with a closed clubface. This means that you aim the face wherever you want the ball to end up. If you do, it will be closed relative to your set up because you set up with you whole body out to the right of the target. A good way to get this is to pick a spot just in front of the ball (intermediate target). As you step up to the ball, aim your clubface at this spot and DO NOT move it. Then, set your body up to the right of the target and DO NOT get comfortable or change positions in any way. This is the final step to hitting a fake draw, and it is CRUCIAL. Because you aimed your whole body out to the right of your target, you have to SWING OUT TO THE RIGHT of your target. This means that you swing along the line of your body NOT down the target line. If you swing parallel to your body and your body is aimed out to the right, your ball will start out to the right. Remember, you set up with the face aiming at your target so it’s closed relative to the path you’re swinging on. This will mean the ball will curve back to your target line and produce the “fake draw” that I am talking about. 1. They don’t aim their entire body to the right. 2. They get comfortable and twist their shoulders/hips back to the left of the target. 3. They don’t have the clubface aimed at the target. 4. They don’t swing to the right. 5. They try to make the ball hook instead of using their normal golf swing with a closed clubface. 6. They aim too far out to the right with the clubface too closed. So the whole idea behind this shot is that you are hitting a regular shot with a closed clubface. To understand it in the most simple terms, simply imagine setting up to the ball just like you are going to hit a regular shot. Now, right before you hit the ball you loosen your hands off the club, turn the clubface closed then re-grip the club in a strong position. With the clubface now closed, you hit your shot. If you hit a ball with a really strong grip like this it would hook to the left of your target. The “fake draw” is just that, except hitting the ball to the left of your target is counter-acted by aiming your whole body out to the right of your target. It really is that simple. Sadly, when you take a golfer out of their comfort zone for some reason they feel the need to use a different swing. Just remember: This shot is your NORMAL swing with a closed face and your body aimed to the right. I sincerely hope you now understand the two different draw shots you can hit and how to hit them. With a little practice you should be able to hit a “fake draw”. If you are able to hit a “real draw” and keep it under control then you may be a better golfer than you think.